Wear patterns in carpets are a common occurrence in older flooring, but how do you prevent them from happening sooner rather than later? Wear patterns are most common in the areas where flooring surfaces transition from a hard surface to a carpeted area and high traffic paths such as stairways and hallways. Without realizing it many people tend to drag their feet as they walk. 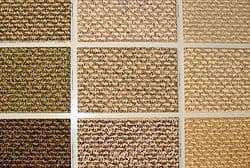 This is a big reason why you will see wear on carpeting in a place that the carpet ends and hard flooring begins because the carpet is at a higher level than the hard surface flooring so people going from the hard surface onto the carpet will tend to crush the fibers of the carpet and it is more noticeable in this spot. And of course more foot traffic and dragging of feet means more wear, weight and crushing of fibers in high-traffic areas such as hallways and stairways and pathways in a room. Some ways to help prevent wear patterns on your carpet are to properly vacuum on a regular basis, place mats at transition areas where hard surface floors meet carpeting, and have regular professional carpet cleanings to get out the deepest layer of dirt from your flooring.